Atmosphere Kanifushi Resort is a luxurious Maldivian hotel constructed on the soft white sands beside the Indian Ocean in the Maldives. Surrounded by vibrant tropical vegetation perfectly balancing bliss, tranquillity and fun, Atmosphere Kanifushi is the ideal destination for an unforgettable journey for couples or families. The hotel has 132 detached villas and suites which are separated by a few meters of tropical flora to offer further privacy for guests. The villas and suites have direct access to an immaculate paradise beach and a beautiful turquoise panorama. 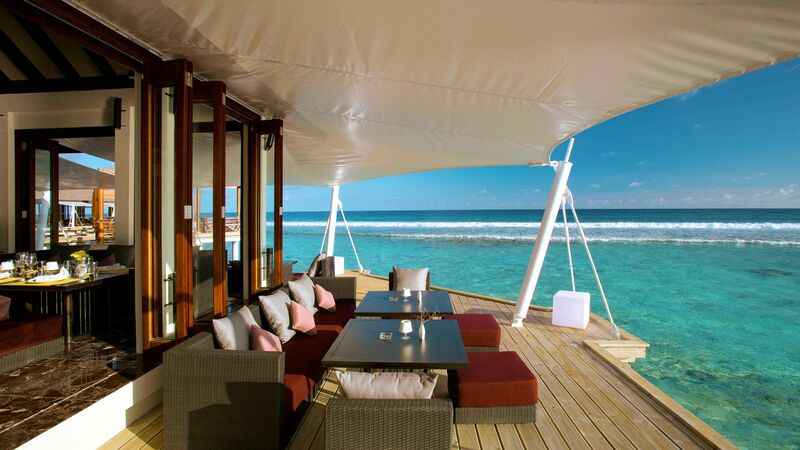 Offering privacy, luxury and a great holiday location, Atmosphere Kanifushi is ideal for a luxury adventure. Guests of Atmosphere Kanifushi can spend sunlit days relaxing on private sun loungers and immerse themselves in the revitalising private pool available in Sunset Pool Villas. The hotel also has two swimming pools for both adults and children. 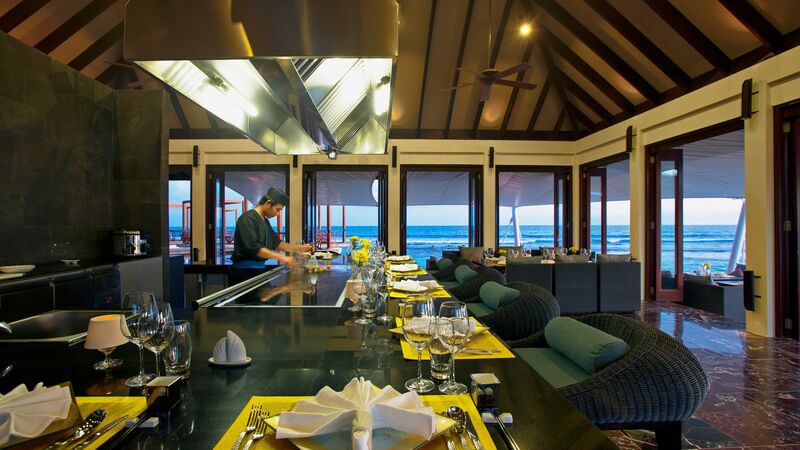 Head to the restaurant or poolside bar for a unique taste of Maldivian recipes with an extensive variety. A range of hotel child prices applies to ages 0–1, 2–4, and 5–14 years. 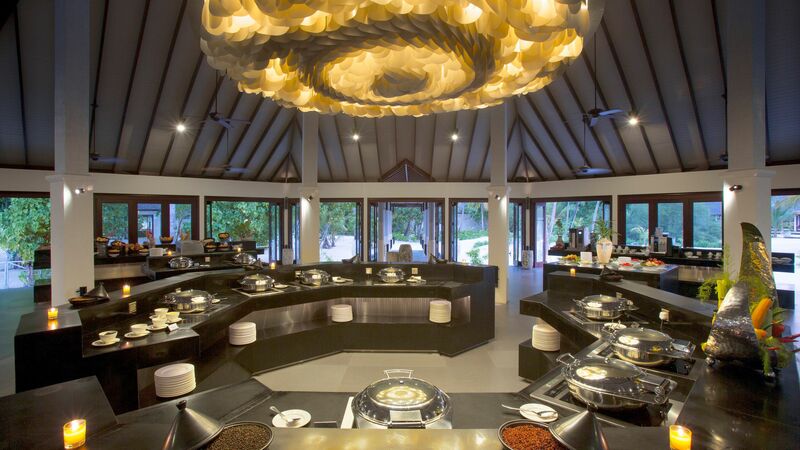 Platinum Plus: Breakfast, lunch, and dinner at The Spice. A la carte lunch menu at The Sunset pool bar. A variety of snacks available during the day and evenings at The Liquid. Lunch or dinner at Just Veg. One à la carte fine dining experience for every 7 nights of stay at The Sunset. Premium brands of beer and liqueurs.Unlimited cocktails and mocktails, signature drinks, juices, soft drinks, mineral water, tea and coffees, and premium wines and bubbles from the Platinum Plus menu (excluding Teppenyaki Grill). In-villa mini bar replenished twice daily with alcoholic and non alcoholic drinks and a selection of snacks. One complimentary excursion per guests from a selection of 6 options. Access to the Club House sports and recreation centre including floodlit tennis court, gym, and indoor recreational activities. Non-motorized water sports, daily snorkelling excursions and equipment, various weekly activities, Kids Club, daily music, DJ, and sunset fishing once per stay. This is the first purely vegetarian restaurant in the Maldives. Just Veg offers delicious vegetarian cuisine that even meat lovers enjoy. The food is served besides the Ocean in an island living ambience. Open: 12:30 - 14:30 and 19:00 - 22:30. Teppanyaki Grill is a restaurant with a unique, Japanese theme where you can enjoy dining at a communal table around a large hot plate. Open: 18:30 -20:30 and 20:30 - 22:30. The Liquid is located near the swimming pool and serves snacks, a range of cocktails, top branded alcohol, and a variety of beers and wines. Spice restaurant serves a variety of cuisines buffet style, with a live cooking stations and grills where you watch delicious dishes made by expert chefs. Open: 07:00 - 10:30, 12:00 - 14:30 and 19:00 - 22:00. Sunset is located next to the adult’s pool and has bohemian sandy floors and a relaxed atmosphere. It serves light meals during the day and Asian and Mediterranean fusions in the evenings. Open: 09:00 - 19:00 and 19:00 - 22:30. 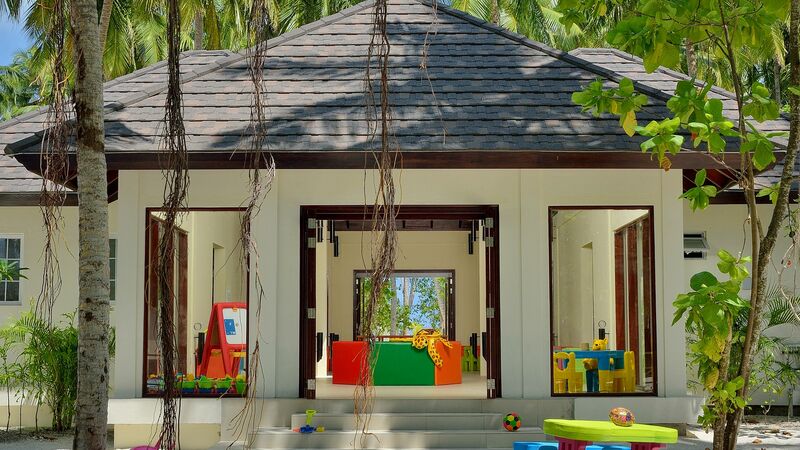 The Kids’ Club is the perfect place for children to enjoy their time in the Maldives. It offers numerous gaming activities and a daily schedule which will fill your little ones’ days with fun and enjoyment. Babysitting services are available at an additional charge for children below four years old. Akiri Spa offers six treatment rooms set among luxurious tropical gardens and offering views of the Eastern Coast of the Island. The spa also has a sauna, steam room and a Jacuzzi, as well as an excellent hair and beauty salon. The hotel offers a wide range of water sports, including windsurfing, Jetlev (Jetpack), wakeboarding and many more. A PADI Dive Centre is also available within the hotel grounds. The Clubhouse is the hotel's sports and refreshment centre, offering daily prearranged activities for adults and children, ranging from fitness to adventure and social events to competitive sports. Counting more than 1,000 islands dispersed through the Indian Ocean, the Maldives is the ultimate get away from it all destination. It is a one hotel per island destination, with properties ranging from luxurious resorts with elegant and trendy restaurants and bars, to sophisticated and zen retreats inspired by the local Maldivian design. 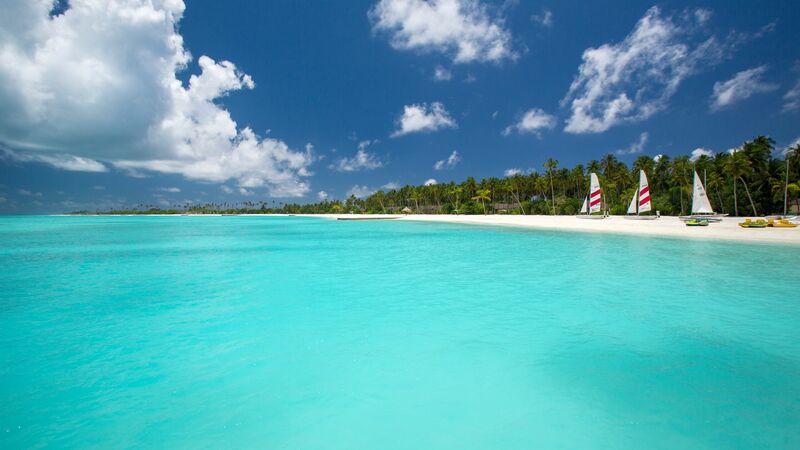 Guests of Atmosphere Kanifushi Maldives can discover many island wonders, including natural swimming pools surrounded by green grass, palms, and paradise beaches. Beneath the azure waters, you’ll find an impressive number of colourful reefs, with the Maldives hitting the list of the best scuba sites in the world. Most hotels provide scuba diving and snorkelling experiences for those interested in discovering the underwater wonders of the Indian Ocean. The Maldives is one of the best spots on earth to spend a luxurious peaceful holiday surrounded by an azure blue heaven. 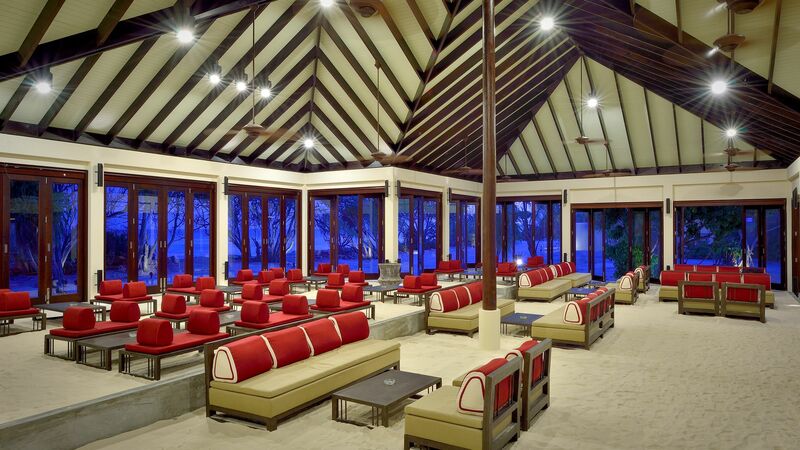 Atmosphere Kanifushi is a 30 minute drive from Male International Airport by seaplane. 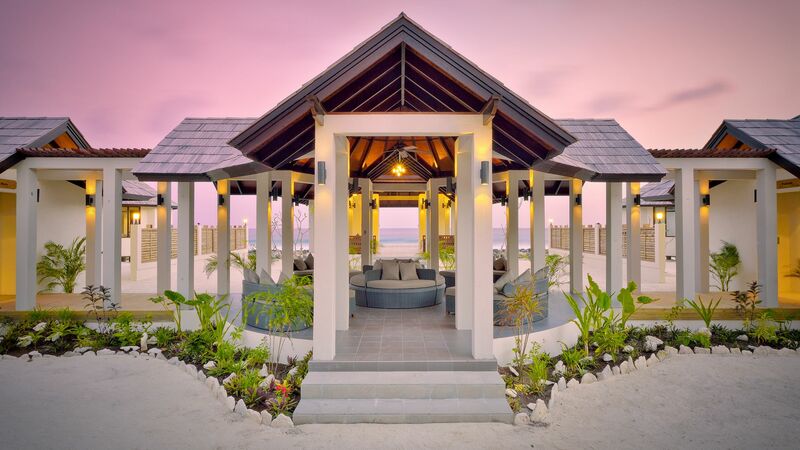 Sunset Beach Villas are nestled along a beautiful stretch of beach each with their own open-air veranda. Inside, an open-air bathroom with whirlpool bathtub can be found as well as a Queen-sized bed. Sunset Beach Villas have direct beach access and private sunloungers. Sunset Junior Suites are located on the beachfront with some of the best views of the sunset at dusk. Junior Suites boast an open-air bathroom with whirlpool bathtub, a Queen-sized bed. In addition, Sunset Junior Suite also benefit from direct in-villa check in, a daily exotic fruit basket, two bottles of wine refilled daily, portable wine cooler, a welcome bottle of sparkling wine with canapés and an additional two bottles of alcohol from the Platinum Plus menu. Sunset Pool Villas have direct access to the beach and feature an extensive outdoor private area with a 30m² private pool. The open-air bathroom has a whirlpool bathtub and the villas share the same facilities as the Sunset Junior Suites but with the following benefits: buggy service, in-villa set menu breakfast (optional), complimentary dining at speciality restaurant, butler service (4 butlers per 10 villas), early morning muffin service with tea and coffee (until 08:00), à la carte breakfast served at The Sunset (07:30-09:30). Sunset Family Villas consist of two interconnecting Sunset Beach Villas with separate outdoor access and are perfect for families or small groups. These villas are located closer to the main restaurant and sport's complex. Save up to 15% on the hotel price when booked at least 60 days prior to arrival, up to 10% discount when booked between 30 - 59 days prior to arrival and up to 7% discount when booked between 15 - 29 days prior to arrival for holidays between 01 January 2018 - 31 October 2019 ( subject to terms and conditions). Save an additional 10% discount on the hotel price (free nights not included) for all guests sixty years and above for holidays between 01 November - 26 December 2018 and 06 January - 31 October 19. Honeymooners staying in a Sunset Beach Villa, Sunset Junior Suite and Sunset Pool Villa for holidays between 01 January 2018 - 31 October 2019 receive exotic fruit basket on arrival, romantically shaped bed decoration once per stay,(turn down service dependent on arrival time), guests will be required to present a copy of their wedding certification on arrival. Minimum stay is required for the offers, for further details please call our Trusted Adviser. Free nights are available on a variety of travel dates and duration, please call our trusted advisers for more information. Please note note all offers are combinable. We went there in October for our honeymoon. The resort is truly beautiful. The private beach is lovely and we loved snorkelling the reefs of the Indian Ocean! There is a huge choice of restaurants and a wide variety of delicious food and drinks available. There are two pools as well. The staff are all very welcoming and friendly. Overall it was a memorable honeymoon and a very relaxing stay. Its literally a piece of heaven!! We were in Atmosphere Kanifushi to celebrate our 30th wedding anniversary with our friends and it was absolutely fantastic. We were here last year for a special birthday celebration and decided to return. We arrived at Male airport to be greeted with "welcome back" and taken to the Atmosphere lounge to be greeted in the same way. We transferred to the and the theme continued, it was always welcome back which was a very nice touch. We were introduced to Shamma who was our "butler" for our stay who took us on a short tour of the island before taking us to our villas. We noticed another lovely touch, we had individual name plaques hanging outside the villas and on entering the theme continued with a welcome back decoration on the bed. The villas were fantastic with a superb outside bathroom. The resort itself is kept extremely clean with a small army of landscape workers who seem to have a never ending job of keeping the leaves off paths and tracks. One thing I would like to mention at this point is the friendliness of the staff, everyone greets you whatever they are doing. The landscape guys smile and wish you good morning/day/evening each time you see them. The buggy drivers always smile wave and greet you in fact I can't remember any member of passing without a greeting. Shamma was fantastic. On arrival she suggested we set up a WhatsApp group so we could stay in contact during our. stay, it worked a treat. If we had any questions or issues we posted to the group and she answered almost immediately every time. Nothing was too much trouble and her responses were always extremely friendly and polite. We had an issue with the wine cooler in the room, it was replaced within 30 minutes, everything was resolved with speed and efficiency. She had already pre-booked activities and dining experiences before we arrived and changed any we requested and chased up the reservations on which we were wait listed. The amenities are great. There are great provisions for children but also more than enough adult only places to hide away if you need to. We spent some of the time in the adult only Sunset Pool/Bar which is great to relax. Food is served in the afternoon which was always tasty and delicious. We also spent quite a bit of time on the beach which seemed like a deserted island at times. The food in the main restaurant, Spice, was very good with plenty of choice. There is a small gem of a place about halfway up the island called Ceylon Bliss. They serve "tasters" of Sri Lankan dishes which are really good but beware as some of them are quite spicy. We were entitled to one meal in the Sunset Restaurant but swapped this for the White Beach Barbecue held on a Wednesday evening, a fantastic experience with fantastic food. We also had a few lunches and an evening meal at Just Veg, again it can't be faulted, everything was very tasty and beautifully presented. The day of our anniversary was a wonderful experience and one that will we will never forget. It started when Shamma came to wish us happy anniversary in the morning, we went into the villa later and the room staff had decorated the bed beautifully (picture attached). In the evening Shamma had booked us into the Teppenayaki restaurant and as we waited outside for the buggy to take us Shamma and a number of her colleagues came to sing us a traditional song of love. It was totally unexpected and extremely emotional. The food, and chef's skillful entertainment, were excellent and finished off a fantastic day. Apologies for the long winded review, it could have been much longer!!! We would like to thank all of the staff at Atmosphere Kanifushi for making our stay special and memorable. We would especially like to thank Shamma as she went out of her way to make sure everything was perfect during our stay and made our holiday special We are already planning to return next year to this very special place. See you soon!!! Our second time as a family to this wonderful island and once again it has not disappointed. The food in the main restaurant (Spice), was always of excellent quality and themed each day to represent the many nationalities staying on the island. The grill had fresh fish every day which tasted fantastic. The main restaurants, which require booking (would advice you pre-book before you arrive) were all absolutely fantastic. Tappanyaki (Japanese cuisine) has a menu to satisfy most tastes and the little chefs show is an added bonus. Just Veg was fab, great vegetarian dishes and the Sunset La Carte menu was lovely. The wine selection for each restaurant was wide ranging and good quality. The rooms were cool and very comfortable with a great open air bathroom and most importantly a twice daily stocked mini bar. Also the cocktails while watching the sunset ticked all the right boxes. The organised trips were well run and took you to some great reefs. We also hired a private boat trip from the dive centre which was fantastic seeing turtles, dolphins (unfortunately no manta rays this time). The guys on the boat were great and guided us on the reef snorkelling trip, spotting things we would have definitely missed, a big thank you to them. Thank you to all the team a Kanifushi for making our trip another relaxing enjoyable special holiday. Lastly and most importantly thank you to Lizzie our guest coordinator who assisted us all holiday and ensured we had everything we needed and could not have been more friendly and helpfully, Lizzie you were great. I?? ?m sure we will be back. I travelled with a friend to AK last July and thought it may be helpful to underline just how good a resort this is for friends travelling together. We wanted to enjoy our own space while sharing time on holiday. Certainly in the low season AK charged no single supplement and we were both upgraded to junior suites next to eachother. I really enjoyed the snorkling trips and found they were ideal for me as I had company rather than hazard going off by myself from the beach. That said the small house reef off the jetty was much more interesting than I expected although it was rare to get it to yourself. Half way through our visit there was a marked increase in families so we centred ourself around the adults only pool (which could do with some more loungers as lots had the same idea). The sunset bar was perfect for a light lunch and staff quickly got to know your cocktail order. One of us was a vegetarian and one had a food intolerance but we both ate very well. Just Veg was super and one night I really appreciated the chef creating me a special menu with a number of GF dishes not normally on the menu. I still think about the rose and lychee sorbet, it was a stand out desert. Thanks go to main man Carlton who seamed omnipresent and dealt with all our little issues (our butler was pleasant but pretty ineffectual and originally messed up all our restaurant bookings) though the service was generally very good throughout. I was grateful too for the one on one guidance I got from the dive team with my lagoon dive. My top tips for the resort would be: To take a small torch when you go out to dinner (there is one in your room but its not very effective) in part so the buggie drivers spot you quickly; Use the room spray and personal mossie gel that is in your room (I found the stuff they provided more effective than the spray I took) and ask your room person to spray and turn lights off at turn down; Walk along the beach, its surprising how empty was all the time; Enjoy the fish and stingray feeding at least once; Go to the spa early in your visit, I left it too late for a second visit but the balinese massage (which was on 'on offer') delivered right next to the reef was one of the best I ever had. Finally, if you can overlook having a proper house reef, the resort is perfect for people who want a fabulous all inclusive (including lots of activities/facilities); those with children and those travelling with friends. I am sure you could have a wonderfully romantic time there but there are probably others that may suit you better if that was your main priority. I hope to return with grandchildren in the next few years. This is the best island ever. I cannot say just how fantastic this place is. From the moment you land in the sea plane to the time you go home. You are looked after so well, nothing is too much trouble. The second year we have been and I am sure we will be back next year.